Events here in Colorado have just become overwhelming for me, however, with an endless series of meetings now set up to search for solutions to the flooding damage that occurred at our Thornton, Colorado Mega-Store. In case you missed the announcement in last Sunday's newsletter, a high-pressure water main burst in the back of our largest store on Friday evening. Within minutes, muddy water was flowing everywhere in our huge 11,000 square foot store, damaging tens of thousands of dollars in both merchandise and fixtures. The resulting geyser of water was not shut off for over two hours, so no corner of our store escaped being drenched. All of the above having been said, it turns out that we were very, very lucky. The huge pipe that burst chose the only time in the week when we had 30+ people in the store, our Friday Night Magic Tournament. To their enormous credit, our Magic players all pitched in to help elevate tens of thousands of comics, trade paperbacks, hardbacks, and cards that otherwise would have been soaked. They also angled a table in front of the gushing water, forcing a great deal of it to flow out of our back door. I cannot express how much I am grateful for their kind efforts in making this awful catastrophe significantly more bearable. All of our fixtures were still soaked to a depth of many inches, but the amount of product that was destroyed was far less than it might have been without their courageous help. The bad news is that the physical structure of our store needs major repairs. We've had water damage control experts in the store since Saturday morning, and they have accomplished miracles in trying to save our fixtures from disintegrating from the soaking. 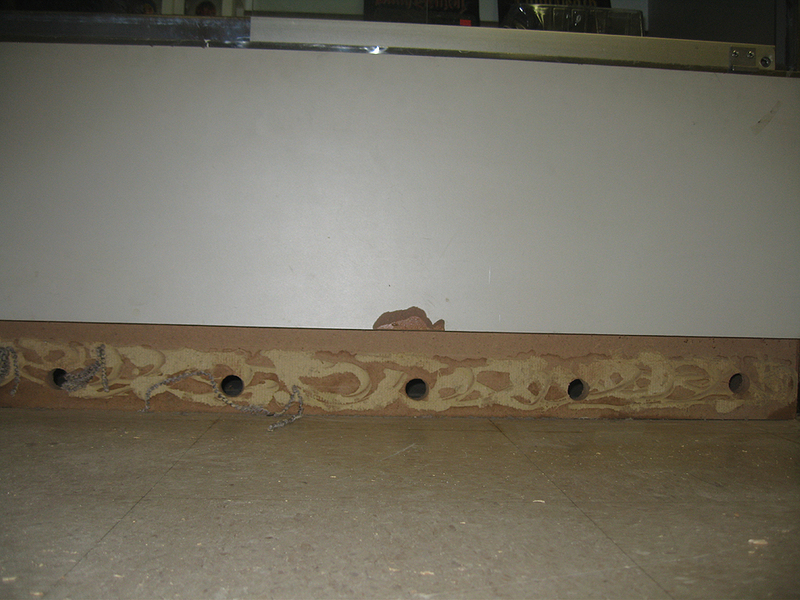 As the accompanying photos show, they used a huge generator and compressor to remove evaporation from the store, and drilled holes in the baseboards of all of our fixtures to try and dry them out. The jury is still out as to how many of their solutions will actually work, but for now it appears that we may be able to repair and/or restore many of the showcases, bookcases, and comics bins that I thought were completely lost. What we cannot save, however, are the floor and walls of the store. The floor tiles are coming up as the huge area gradually dries, and all of the wet wallboard will need to be cut away to prevent mold. 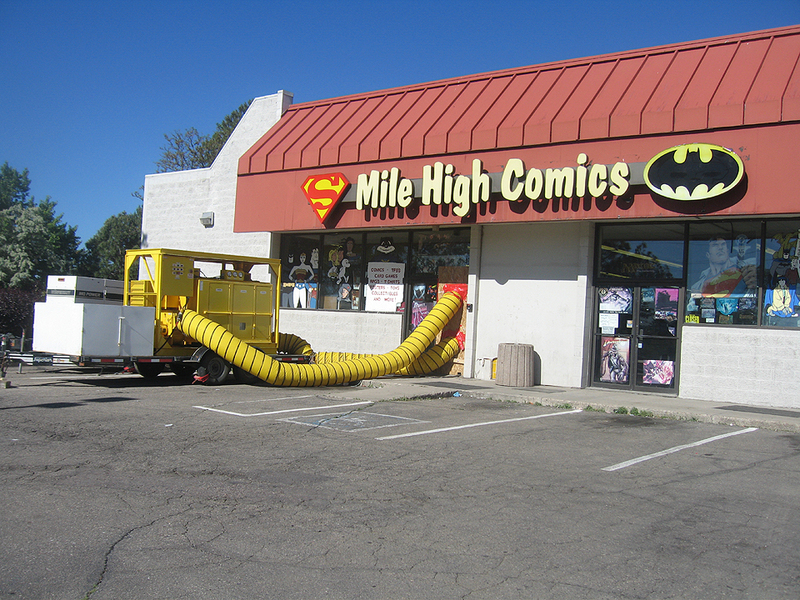 With no floor or walls, we simply cannot reopen for business except to the extent of allowing our regular customers to pick up their weekly new comics shipments. With the store now basically uninhabitable, the next step is figuring out the legal ramifications. Our insurance company has urged us to move out, and has offered to pay at least some measure of our moving expenses. Trying to empty an immense store like Thornton, however, is a job that even makes an experienced retailer like me quail at the thought. Talk about a logistical nightmare... On top of that consideration, I have to A) find a new location, and B) meet with my attorney to discuss the legal ramifications of moving, and the litigation we will surely have to endure in order to try and get whoever owned the water main to reimburse us for whatever losses that the insurance company will, inevitably, refuse to cover. Suffice it to say, this is going to be a very expensive and time-consuming endeavor. Missing the Knoxville and Richmond shows is just the beginning of what I am now certain will be an effort that will preclude my being able to travel to many conventions over the next 90 days. I have rebooked my flights so that I can still attend the wonderful Charlotte Heroes convention June 20th-22nd, and the Chicago Wizard World convention June 26th-June29th. The period between the end of June, and our leaving for San Diego on July 19 (we're driving...), has to be left open for the time being, however, as I simply must deal with resolving what we're going to do with the Thornton store. Sigh... While dealing with the flood damage has been quite depressing for me, it has been incredibly heartening to see so many of you sending in orders to us over the past 72 hours. The 25% off FLOODHELP codeword that I put into effect on Sunday afternoon has created a backlog of orders that will ultimately help cover some of the mounting costs that we're now incurring (codeword does not apply to new comics or the Dallas Stephens consignment issues). Given that every hour that passes results in my realizing yet another set of costs that need to be borne in order for us to get the Thornton store back into operation, however, I am not going to end the FLOODHELP sale anytime soon. While on many levels it is distressing me beyond all measure to see so many of our best comics being sold at a minimum of 62% off (after the 25% off FLOODHELP is applied to comics already listing for 50% off...), I am pragmatic enough after 38 years of warding off all kinds of financial catastrophes to know when we have to be willing to give up some of our gains, in order to safeguard our future. This is an instance where I have no choice but to offer all of you a chance to purchase whatever you wish from our entire back issue inventory at prices that end up being far below what we need to operate our business for the longer term. That having been said, however, I have been extremely successful at scoring great comics deals over the past eight months that I have been on the road, so I am thankful that we have been blessed with such a bountiful selection of comics to be able to offer you at these great prices. I am also incredibly grateful to all of you who have already placed orders with us utilizing the FLOODHELP codeword. Your kindness will not be forgotten..